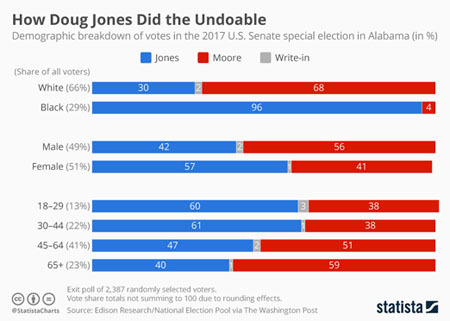 In part at any rate the good guy Doug Jones won in the Alabama special Senate election on December 12, 2017 by leaning on at least something somewhat like the “rigged-electoral-system” luck that almost accidentally gave Donald Trump the US presidency in November 2016. In the end, 96% of Blacks, 61% of 30–44 year-olds, 60% of 18–29 year-olds, and 57% of Females voted for Jones. Could this — African Americans, younger adults of all cultures, and women — be at least one road to some new progressive coalition in the Old South? Those determined to show their savvy cynicism about current politics in the troubled American democracy will stress that, even with lady luck smiling his way, Doug Jones only managed 49.9% of the December 12 vote to Roy Moore’s 48.4%. And even my own favourite Doug Jones supporter in all of the United States and Canada concedes that if President Donald Trump’s original favourite Alabama Senate candidate Luther Strange had been running instead of Roy Moore, the Republicans would almost certainly have won. 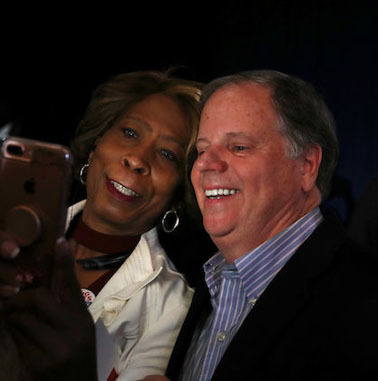 More immediately, just what Doug Jones’s victory may or may not mean for the 2018 mid-term Congressional elections nonetheless remains one of the most compelling questions about American politics in the new year just now on the horizon. Whatever else again, the Jones victory cannot be seriously construed as bad for the Democrats in 2018. The Mueller investigation is not the only hopeful prospect for the containment of the almost accidental Trump administration over the next few years. 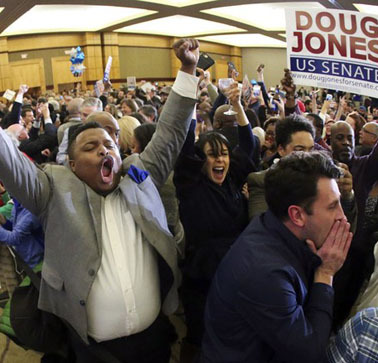 Meanwhile, the largely unexpected triumph of the Jones Boy in Alabama ought to remind all concerned observers of the USA today everywhere of one key piece of non-fake news. In quite living memory, the mixed-race Barack Obama from Honolulu and Chicago was twice elected President of the American Republic — by more commanding numbers than anything Donald Trump could show in November 2016 (even with all his “Art of the Deal” mendacity on feverish display). With any luck at all history should finally show that the presidential elections of 2008 and 2012 (not 2016) marked the real beginnings of the greatest America of the long-term future. Is Stormy Daniels on the edge of a political career at last? Who or what is really to blame for the dump President Trump has to live in? Mar-a-Lago dreamin’ : is the Trump administration finding its feet at last? Northern lights on US election II : What if Conrad Black is right and Donald Trump actually wins ??? ?